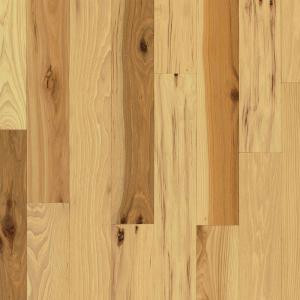 The Bruce American Treasures Country Natural Hickory 3/4 in. Thick x 3-1/4 in. Wide Random Length Solid Hardwood Flooring features a beautiful light color and a satin gloss. This traditional style flooring has a very high Janka wood hardness rating/resistance to denting of 1,820. The planks have micro-beveled edges and square ends. This hardwood flooring is designed for nail-down installation. 22 sq. ft. per case. Case weight: 70 lb.